I guess the meatballs aren't really little and the subs aren't that great. 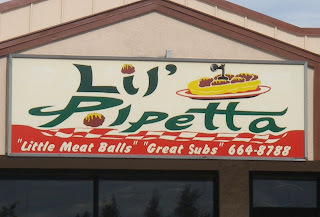 By the way, what is that thing sticking out of the meatball sub on the sign? A wind gauge? I can't even tell what the name of the place is. Lil Poipetta? and since when were "ittle meat balls" something to brag about?